The castle town of Aizu-Wakamatsu (pop. 120,000) lies about 8km from Lake Inawashiro. Its history revolves around the influential Aizu Matsudaira clan and the rebellion against the Meiji Government. 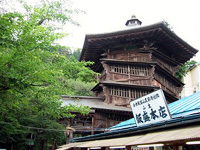 Aizu-Wakamatsu was founded over 1,000 years ago and is the oldest town in Fukushima prefecture. Ashina Naomori built the town first castle in 1384 and called it Higashi Kurokawa Yakata. 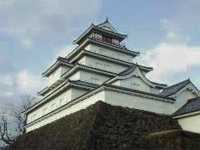 Gamō Ujisato extended the castle in 1593 and renamed it Tsuruga-jō (鶴ヶ城). 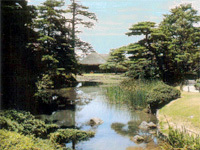 The town was then ruled by the Aizu Matsudaira daimyō from 1662 to 1868. The town was loyal to the Tokugawa shōgunate and in 1868, a group of young local samurai, known as the Byakkotai (白虎隊, "White Tigers Band") rebelled against the new Imperial government of Meiji. The Byakkotai fought for a month before all commiting ritual suicide on top of Iimori-yama Hill (飯盛山), where their graves are still visited by nostalgic of samurai loyalty. Also note the 18th century Sazae-dō Hall at the top of the hill. In 1874, the Meiji government burnt down the castle, which symbolized the samurai spirit of the region. 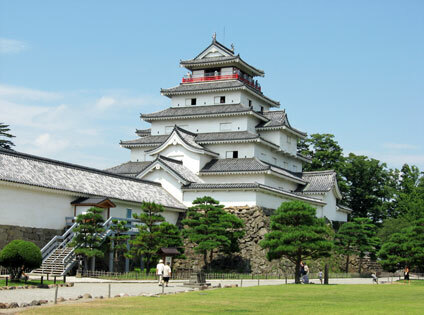 The old Tsuruga-jō Castle (￥400, open 8:30 am-5:00 pm) was reconstructed in 1965. It is ferro-concrete, so it lacks the charm of an original castle, but it gives a good idea of the former power of this small and remote town of the Tōhoku. Between the castle and Iimori-yama, you will find the beguiling Oyaku-en Garden (御薬園, ￥300, Apr-Oct 8am-5pm; Nov-March 8:30am-4:30pm). The garden takes its name ('oyaku' means 'medicine') from the medicinal herbs grown there, and local herbal tea can be purchased at the souvenir shop. South-east of Oyaku-en, a relatively interesting Samurai Residence Complex (￥800, Apr-Oct 8:30am-5:30pm, Nov-Mar 9am-4:30pm) with attached museum and good explanatory leaflets in English. The town is quite spread out, and you might consider to catch a bus or taxi between the various attractions. From 22 to 24 September the Aizu Aki Festival has folk dances and parades in samurai attire. From Tokyo, take the Yamagohi Shinkansen till Koriyama (90min), then change to the JR Aizu liner for one more hour before reaching Aizu-Wakamatsu (total fare about ￥5000). Coming from Sendai or Aomori, you also have to change train at Koriyama. The nearest airport is Fukushima, about 2 hours away by train, then bus.